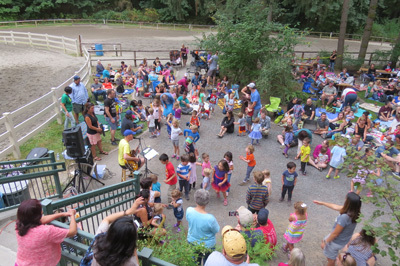 Between 300 and 400 people came out to hear Caspar Babypants (Chris Ballew) perform songs for kids. Parents and grandparents with small children packed our picnic area. Chris took many standards songs and creatively revised them for maximum involvement of the kids. Many families brought elaborate picnic dinners, served on blankets or picnic tables. The kids thronged in front of Chris and sang and waved with the music. They appeared to be having a wonderful time.